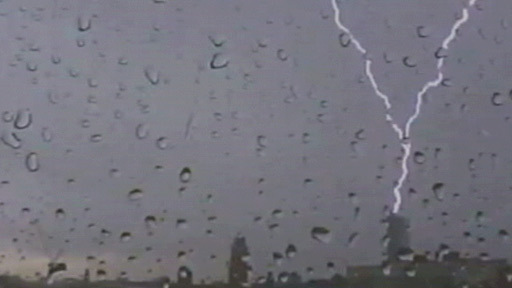 A university video technician captured the moment Manchester's iconic Beetham Tower was struck by lightning. The 47-storey building, one of the tallest in the UK, was hit by forked lightning during a storm over the city on Thursday morning. Andrew Cooper captured the moment with a webcam set up on his office window sill at the University of Manchester. "I'd set the camera up and I didn't expect to catch anything like that - it was a hell of a bang," he said. The lightning struck at 0920 BST on Thursday as a storm rumbled over the city and surrounding area. But despite the direct hit, the building's roof remained undamaged. The £150m building's designers said this was because the lightning struck the steel fin on top of the building. Ernst Ter Horst, of Ian Simpson Architects, said: "One of the functions of the blade structure is to carry electricity down the building right down into the earth's core. "It's connected into the structure of the building as a reinforcement which provides a rapid conductor down into the earth." The Beetham Tower stands 561ft (171m) tall at the junction of Liverpool Road and Deansgate in central Manchester. It is the tallest building in Manchester and is said to be one of the tallest residential buildings in Europe. A Hilton hotel occupies the first 23 floors of the building.